A special shout out to Samantha, pastry chef at the Goa Marriott Resort for her award winning cake design. When I went to discuss my ideas for Scott’s birthday cake with her last week I stressed how important it would be to get the details of a roulette wheel accurate because Scott loves roulette as you may recall from a previous post. I was stressing….that it wouldn’t come off right. I even brought his roulette game down to the kitchen to show her. I needn’t have worried at all. Wouldn’t you know, in yet another stroke of synchronicity, Samantha said Oh! You mean something like this? and whipped out her iPhone to show me a roulette wheel cake she had made once before for a cake competition that she won! We tweaked her design to personalize it for Scott, including having the sugar roulette ball landing on number 12 , casino chips with his other lucky numbers, and playing cards made of spun sugar with a special message from his mother: 62 years his way! Love, Mom. I asked Samantha to make the playing cards in only the suit of hearts…..what I hadn’t anticipated was that she used the K for king and the A for ace……KA being my initials. Oh, and that gold leaf spinner on the top really spins! Scott did spin his roulette game, just once. His lucky 0 came up. This entry was posted in Uncategorized and tagged award winning cake design, birthday parties, gambling, Going to Goa Blog, Katy Allgeyer, love, marriott goa resort, roulette wheel theme cake, Scott Morgan, synchronicity. Bookmark the permalink. « h a p p y ! birthday, scott! 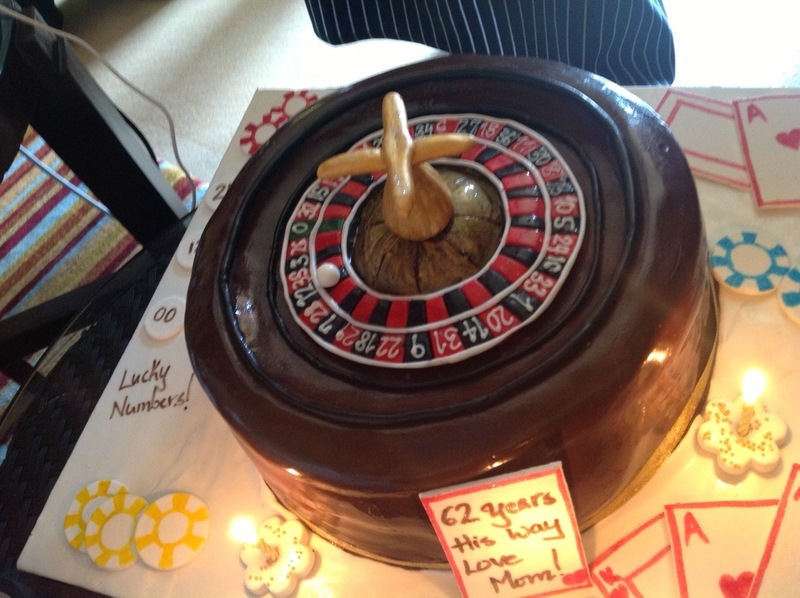 Great cake!, and the spinner spins too? Wonderful! Great job, Katy, Happy Birthday Scott! all the stars lined up just as they were meant to…how to go Katy!!!!! !